Home theater rooms have become very popular over the course of the last few years as the technology that provides the experience has improved. More and more people favor the comfort and benefits of watching a great movie at home with friends (and pets) over dealing with crowds, expensive condiments and parking hassles. It just makes sense. The average home theater today is a media room in a home that has been accessorized with rows of seating, a big screen and projector and the occasional popcorn machine. The concept can be taken much further with a true theater experience including curtains, risers (leveled platforms) and theater lighting. This is more often done in more affluent homes because the cost of custom making the molding, risers, columns and banisters etc can run into the six figures and some even much higher. This leaves people like myself standing in the cold wanting to get inside. 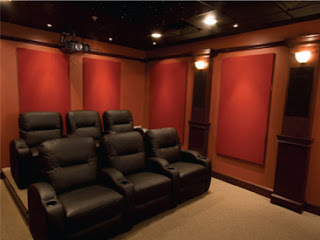 Having a home theatre at home can provide entertainment and enjoyment for you and your family.